I have been a local garlic convert for two years and one month now. My conversion happened in Ontario when my friend and I attended the garlic festival weekend at the Carp farmers’ market. There were garlic growers everywhere, spouting off names I’d never heard: Music and Porcelain and Russian . . .
At first, I was shocked at the prices – generally about a dollar a bulb. A dollar a bulb! I could buy a Chinese bulb at the grocery store for 30 cents! However, it was the garlic festival, so I thought I should try a couple. When I got the garlic home and broke into the bulb, my world changed. The clove smelled fresh and pungent at the same time, and the texture was firm and juicy. This is what garlic is meant to be, I thought. 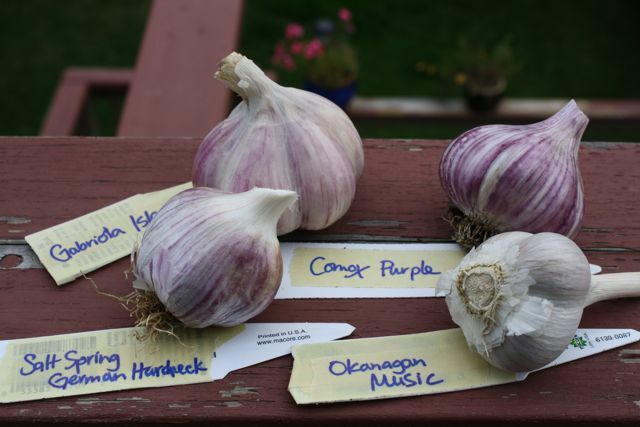 I spent the next few weekends scouring farmers’ markets, looking for more local garlic. After a couple weeks, it disappeared from the markets. I asked the farmers and they said they just couldn’t grow enough to meet demand. Our bulbs lasted a few weeks more . . . It was a sad, sad day when I had to go back to bland and wimpy grocery store garlic. I vowed not to let it happen again. Which led to possibly my greatest discovery in the past year: I can grow my own garlic in my deck garden! The leaves grew and grew until June, when they pushed out scapes (flowery bulbs) on their tips. I wanted the bulb to keep growing, so I cut the scapes off and put them in water in a vase in the house. The scapes slowly peeled themselves open to reveal dozens of tiny cloves. Finally, in July, most of the green leaves growing in the pots died down, and it was harvest time. I wriggled my fingers down into the dirt and found six perfect bulbs. I let them dry out in a cool room in the basement for a couple weeks. Then I braided their shoots together and nailed the braid to our kitchen wall. Whenever I need a bulb, I cut one off the braid. It will keep this way for ages. Last year’s garlic ran out in February this year, and it was still perfectly fresh. I’m hoping our garlic this year lasts till July when the next harvest comes. This year, I have four local varieties to plant: Salt Spring German Hardneck, Okanagan Music, a purplish one from Gabriola Island, and my trusty Comox purple from last year. Please, find some local garlic before it’s too late and plant a few cloves. May the conversion begin. A scientific note: If you are wondering how pouring your used coffee bean grinds from your French press affects the garlic . . . I conducted a very scientific study and it appears garlic that was fed coffee grinds every morning is about 5 to 10 per cent smaller than my control pot, which was only fed water. Maybe the garlic prefers tea? 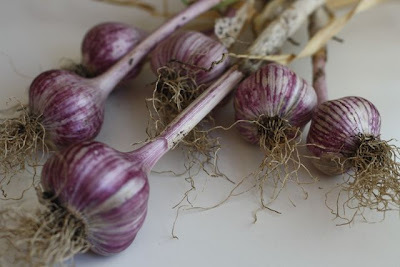 If you'd like to join the festival, leave your comment or recipe about garlic on my blog and the others' blogs. The idea is to get everyone talking about what's ripe right now and how we can eat it. 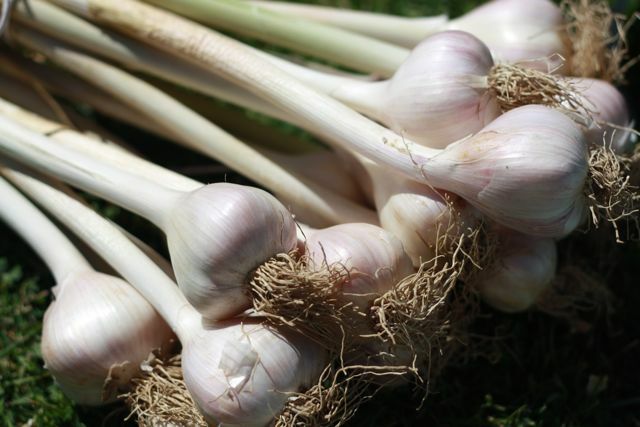 I bought this kind of garlic at the farmer's market and was amazed at the juice - who knew? Thanks for the gardening with garlic primer - I'll have to give this a try! Hey, that is a GREAT idea. Now to scour the farmer's markets down here...! Hey! Just wanted to let you know that I've planted some garlic, in hopes that a spring plant will reveal positive results. I'm also planning on trying in the fall! Wendy, I hope you have a very successful crop!